TPL20 electric pallet truck is a full professional machine suitable to support the most demanding activities in terms of flexibility, robustness reliability. TPL20 represents Pegasolift the main structure to develop special machines to handle rolls and other specific load units. Electric pallet truck TPL20 belongs to the heavy duty Pegasolift TPL family. These machines are engineered to cover even a triple shift work load. Machines’ frame with heavy structural thickness, guarantee incredible impact resistance and load stress. 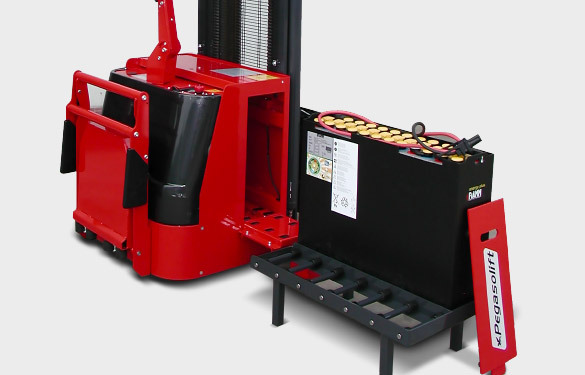 Front wheels, with a special configuration, allow easy insertion of the pallet to reduce fatigue and time required for loading operations. This electric pallet truck has various types of equipable batteries (up to 315 Ah Ld/Ac or Li-Ion) also with quick-change side door and rollers. These pallet trucks’ traction and lifting engines are over dimensioned and reliable and allow a long lasting working career.